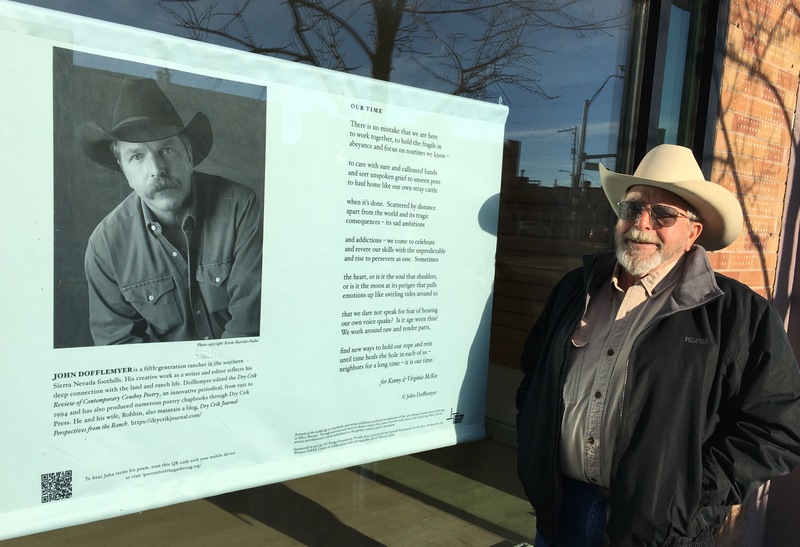 As we were leaving Cowboy Joe’s with coffee, Bob spotted me this morning in downtown Elko, on Cedar Creek’s store window—an aged portrait by Kevin Martini-Fuller with my poem “Our Time”, dedicated to our neighbors at home, Virginia and Kenny McKee. By scanning the bar code in lower left hand corner, you can hear my recitation of the poem or see ‘Audio Poems’ in the menu above. This entry was posted in Photographs and tagged ”Our Time”, Elko, Kenny and Virginia McKee, National Cowboy Poetry Gathering. Bookmark the permalink. You haven’t changed a bit, except for the beard! What a cool thing. Way to go John! Was in Elko in August, wish I had seen it! !